OXFORD, Miss. — The last home regular-season series of the year brought the No. 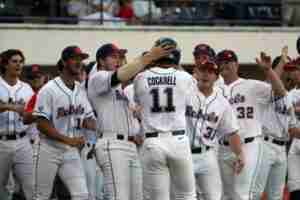 16 Auburn Tigers to the friendly confines of Swayze Field where Ole Miss had not dropped a series all year. 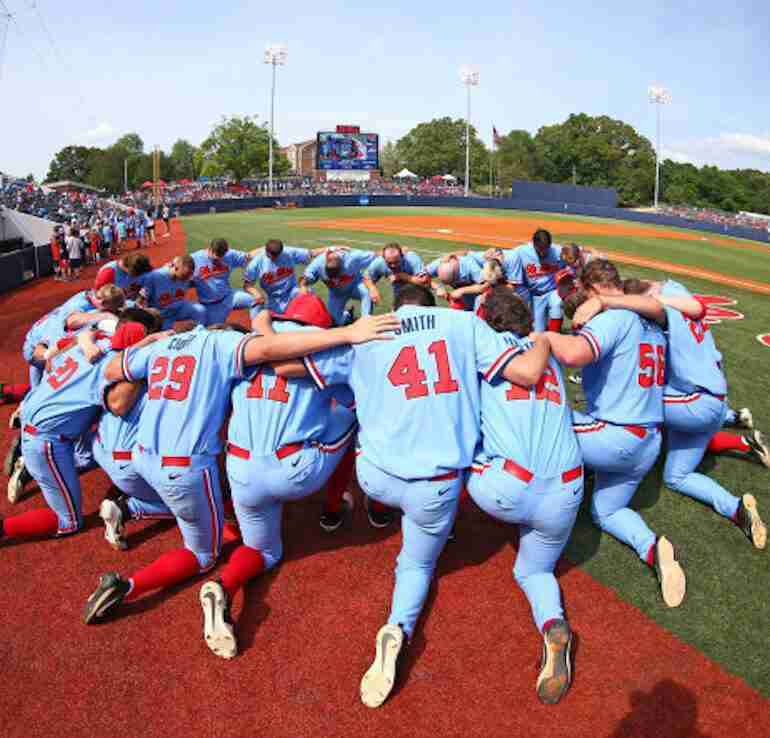 Entering the weekend, the Rebels and Tigers sported identical SEC records of 13-11, making the series pivotal in the race to Hoover as each team attempted to secure one of the coveted top four seeds in the SEC tournament. Ryan Rolison turned in another gem of a pitching performance, going 6 ⅓ innings and limiting Auburn to a single run until the seventh inning. The draft-eligible sophomore notched three 1-2-3 innings, scattered five hits and recorded five strikeouts. Rolison earned the win over the Tigers, improving to 7-4 on the season. 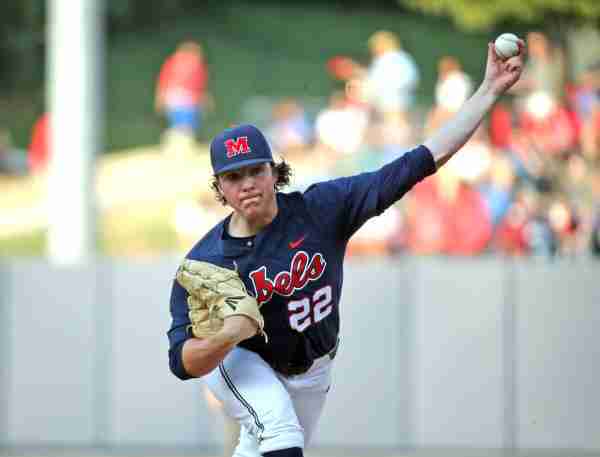 Rebel closer Parker Caracci threw the last 2 ⅓ innings. He faced only one more than the minimum, allowing a one-out double in the eighth inning which was the potential tying run. Of the seven outs he recorded, the sophomore threw four strike outs. Pitching a 1-2-3 ninth inning, Caracci earned his team-high ninth save of the year. Ole Miss batters applied consistent pressure on the Auburn pitching staff, scoring in the second, third, fourth and sixth innings. In the second, senior captain Will Golsan powered his fourth home run of the season to left center field that also scored Cole Zabowski. The home run parade continued in the third inning with Nick Fortes’ solo shot, also to left center field. In the fourth inning, freshman Tyler Keenan doubled to score Thomas Dillard. Dillard had singled to lead off the inning, followed by a steal of second. The Ole Miss scoring concluded in the sixth inning when Dillard scored his second run of the game on a Will Golsan single. It was Golsan’s third RBI of the game. With a run in the sixth and three in the seventh, Auburn closed to within one; however, they would not be able to get the tying run home. “It (the win) was huge,” Golsan said. Junior right fielder Ryan Olenek’s 23-game hitting streak came to a close Friday night. The streak, second-best in the SEC for the season, ties Olenek with Preston Overbey for the third-best Rebel hitting streak of all time. Auburn saved Casey Mize, the Tigers’ pitching ace and projected number one pick in the upcoming Major League Draft, until Friday night, making the second game of the series one that drew attention from around the country. 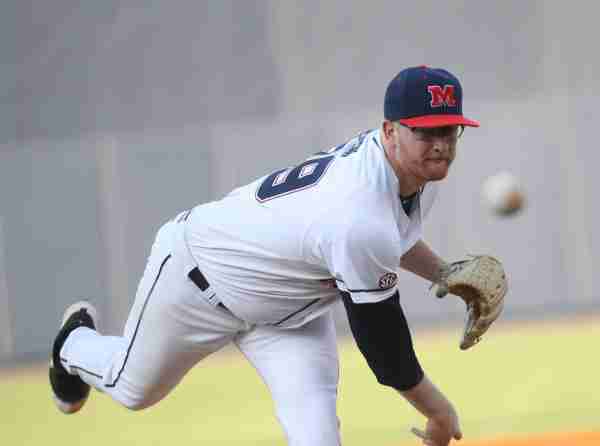 Ole Miss threw its regular game-two starter, Junior captain Brady Feigl. One pitcher would pitch what was arguably his best game of the season—if not, career—throwing eight complete innings and registering a career-high in strikeouts. If you guessed Brady Feigl, not Casey Mize, was the pitcher to whom Keenan was referring, you’d be 100% correct. Feigl completely dominated on the mound, retiring the first 11 Auburn batters in order. 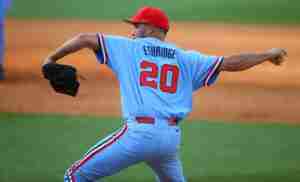 He struck out 12 Tigers on the day.Feigl gave us everything he had tonight,” Coach Bianco said. Though the Rebels were playing the likely No. 1 draft pick in Mize, Feigl and his teammates focused on their own performance. “The slider was really the key today. That was really good for me today,” Feigl said. The Rebel batters backed-up Feigl’s performance on the mound, ultimately chasing Mize after only five innings. 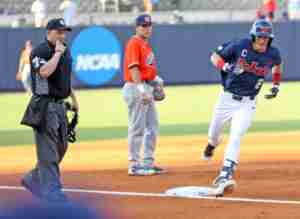 Similar to what they did Thursday night, Ole Miss used a pair of two-run homers to put runs on the board. Designated hitter Chase Cockrell homered to left in the second inning to plate Tyler Keenan. Cockrell’s home run was the longest of the weekend, measuring 413 feet. In the fourth inning, Tyler Keenan homered, also to left, to score Cole Zabowski. The fifth inning saw Grae Kessinger double early in the inning, followed by Thomas Dillard’s double that scored Kessinger. The Rebels also added runs in the sixth and seventh innings, as Keenan doubled home Will Golsan in the sixth, and Dillard scored on a throwing error in the seventh. Friday’s win marked the 800th victory of Mike Bianco’s career as head coach and his 700th victory as the head coach at Ole Miss. “I’m very fortunate, very blessed,” Coach Bianco said when asked to reflect on the milestone. After winning the first two games of the series over the Tigers, Ole Miss found itself with an opportunity to do something the Rebels had not done in the eight previous SEC series—sweep their opponents. A sweep would keep the pressure on SEC front-runner Arkansas for the top spot in the SEC West. The hitters for both teams applied pressure to each of the starters very early in the game, resulting in calls to the bullpen in the second inning for both. Auburn scored a run in both the first and second innings and had the bases loaded with one out in the second inning before Mike Bianco called on reliable reliever, sophomore Will Ethridge. Facing a pivotal bases-loaded situation, Ethridge came in and struck out the Tiger three and four-hole hitters to keep the score at a 2-0 Auburn lead. His clutch performance at such a crucial time was huge for the Rebels. The bottom-half of the second saw the Rebels piece together three runs on three hits, including a Grae Kessinger double. And when it was time for Ethridge to head back out to the mound, simply put, he dazzled. The 6-foot-5, righty pitched 6 ⅓ innings, allowing only three hits and one run, while notching a career-high 10 strikeouts. Through six innings, the Rebels and Tigers were tied at three. But in the Ole Miss half of the seventh, Tyler Keenan led off with a monster 410-foot solo home run to right field to put the Rebels ahead at 4-3 going into the eighth. B7 | BOOM! Tied no more thanks to a solo shot from @TylerKeenan_10. Ethridge was again brilliant in the top half of the eighth, as he slashed through Auburn’s 4-5-6 hole hitters, getting Julien to go down swinging, forcing Venter to ground out to third, and inducing Estes to ground out to second. 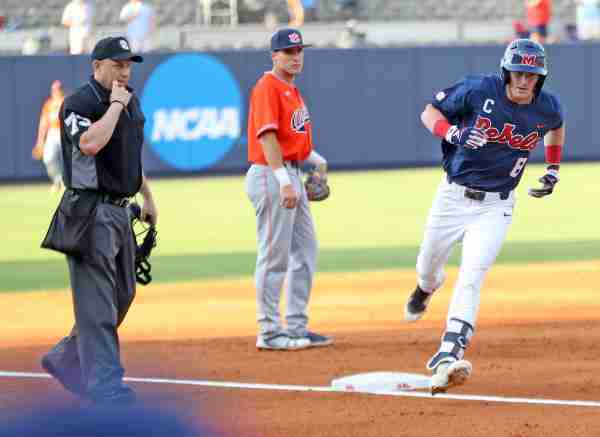 After that scoreless Auburn eighth, the Ole Miss hitters looked to add to the Rebel lead. Facing an Auburn bullpen that seemed somewhat worn down, Ole Miss put together its best inning of the weekend, en route to scoring six runs in the bottom of the eighth. Chase Cockrell, Michael Fitzsimmons and Nick Fortes all doubled, while Thomas Dillard, Will Golsan, and Grae Kessinger singled. Tyler Keenan was hit by a pitch. Cockrell and Fitzsimmons each recorded two RBIs on their respective doubles. B8 | Bust it open, Chase Cockrell! The Rebel DH bounces a ball fair down the third base line, plating two more and widening the Ole Miss lead. With a 10-3 Ole Miss lead going into the top of the ninth, closer Parker Caracci took the mound for the Rebels and held Auburn scoreless. The victory clinched the first series sweep in SEC play for Ole Miss this season. After the weekend, the Rebels improved to 39-13 overall and 16-11 in the SEC. With an RPI of 7, Ole Miss is without a doubt in the discussion for a National Seed. Ole Miss freshman Tyler Keenan continued to impress, going 5 for 9 at the plate this weekend and playing outstanding defense at the hot corner. Keenan is definitely making a case for SEC Freshman of the Year. The Rebels hit the road for the last week of the season as they visit Arkansas State on Tuesday at 6:30 p.m.
Ole Miss concludes SEC regular season play with a trip to Alabama in a Thursday-Friday-Saturday series, with game times scheduled for 6:00 p.m. Thursday, 6:00 p.m Friday, and 1:00 p.m. Saturday.